As part of the new Article 124A, which details the composition of the National Judicial Appointments Commission, Article 124A(1)(d) envisages the presence of two eminent persons on the NJAC, who are to be nominated by the committee comprising the Prime Minister, the Chief Justice of India and the Leader of Opposition in the Lok Sabha (or the Leader of the single largest party Opposition Party, as the case may be). The proviso to this clause mandates that one of the eminent persons shall be nominated from amongst the persons belonging to the Scheduled Castes, the Scheduled Tribes, Other Backward Classes, Minorities or Women. Article 124A, insofar as it envisages the inclusion of two eminent persons in the NJAC, was repeatedly attacked for being vague and for the lack of any guidance regarding their selection. Further, the petitioners contended that the presence of the eminent persons on the NJAC would be violative of the independence of the judiciary insofar as the executive, with the support of the eminent persons might act as a structured bloc to block an appointment. Public confidence is imperative for our judiciary, particularly in light of its powers of judicial review which are largely unparalleled in the world. Eminent persons are intended to be members of the public, presumably detached from the rigours of the legal profession. Their presence on the NJAC creates a direct stake for the public in the appointment process and ensures to them that the judges so selected would be sensitive to their interests. It is also indecorous to say that eminent persons being non-judicially or non-legally trained would be unable to assess candidates on the qualities requisite of a judge. It is reasonable to assume that these eminent persons would be ably guided by the Chief Justice and other judges on the NJAC in his functions. Yet again, the NJAC is to be viewed as a collective where each member would facilitate the other in assessing relevant qualities of the candidates placed before it. 3. Eminent persons will act as a check against arbitrary exercise of power by any of the other members on the NJAC. They would be truly independent individuals who approach the appointments process from a detached standpoint. It was repeatedly argued by the petitioners that the Law Minister with the support of any one of the two eminent persons can potentially block any appointment. On the contrary, their non-alignment with any of the other members on the NJAC would make them vigilant against any purported collusion to steer or block an appointment, acting as a much-needed check and balance. Evidently, eminent persons would serve an important purpose on the NJAC, eventually bettering the quality of judges who would be appointed. Additionally, the presence of the Chief Justice of India is a sufficient safeguard to ensure that persons who will add value to the process of selecting the most appropriate candidates for judicial office would be selected as “eminent persons” on the NJAC. In fact, the argument that one of (or both) the eminent persons would collude with the Law Minister is in utter disregard of the constitutional trust attaching with the offices of these high constitutional functionaries. It proceeds on the assumption that a committee which also consists of the Chief Justice would choose a political appointee who is vulnerable to the influence of the Law Minister, thereby simultaneously casting aspersions on various branches of the government! Lastly, and on a purely factual basis, it is argued that even previous reform proposals which have recommended a judicial appointments commission for India comprising “eminent persons” have done so without laying down any stated criteria for their selection. This is in response to the petitioners’ contention that the 99th Amendment does not lay down any guidelines/criteria for nominating eminent persons. The National Commission to Review the Working of the Constitution (Venkatachaliah Commission) proposed an appointments commission comprising the Chief Justice of India, 2 senior-most judges, the Law Minister and 1 eminent person, a model which was advocated by the petitioners themselves on several occasions. The eminent person on this commission was to be appointed by the President in consultation with the Chief Justice of India. Notably, no criteria had been prescribed for the selection of such eminent person in this model, which was modified and adopted as the Constitution (98th Amendment) Bill, 2003. The same holds true for the Judicial Appointments Commission Bill, 2013 which envisaged a commission with two eminent persons who were to be nominated by the Prime Minister, the Chief Justice and the Leader of the Opposition in the Lok Sabha. These two reform proposals, along with others, were taken into due consideration by the Parliament while passing of the 99th Amendment. None of these prescribed any criteria for the selection of eminent persons on the appointments commission. The 99th Amendment has clearly not devised a legislative innovation insofar it speaks about the presence of eminent persons on the NJAC. In any event, the 99th Amendment and the NJAC Act provide a skeletal structure for the establishment and constitution of the NJAC. Specific details with regard to the nomination, qualification, removal, et al of the eminent persons can be gradually formulated. A challenge to the 99th Amendment on the grounds invoked by the petitioners seems misplaced. In light of the above, it is argued that the presence of two eminent persons on the NJAC is not per se violative of the independence of the judiciary. In his two–part essay, Gautam Bhatia has persuasively argued that the 99th Amendment to India’s Constitution, insofar as it introduces a new Article 124-A, infringes the Constitution’s basic structure, and is therefore liable to be declared as null and void. Gautam’s contentions are based broadly on the judgment of a nine-judge bench of the Supreme Court in Supreme Court Advocates-on-Record Association v. Union of India [“The Second Judges Case”], which, he argues, effectively holds that granting primacy to the judiciary’s opinion in the process of appointment of judges to the Supreme Court is integral to the guarantee of the independence of the judiciary. Since several other cases have recognised the principle of judicial independence as comprising a part of the Constitution’s basic structure, to strip Article 124 of the primacy that it grants to the judiciary, he submits, would tantamount to making an unconstitutional amendment. Unfortunately, I’m unable to agree with this view. In arguing in favour of Article 124-A, I won’t rely on too many fresh authorities. Instead, my endeavour would be to merely refute Gautam’s argument that the 99th amendment is unconstitutional in light of the ratio in the Second Judges Case. At the outset, I must say that regardless of what the findings in the Second Judges Case were, the present challenges to the 99th Constitutional Amendment ought to have been referred to a bench of 11 judges. This is, after all, the first time that the Constitution has been amended to alter the process of making appointments to the higher judiciary. And given the extent of controversy over the questions raised, and given the well-documented lack of confidence in the present system, carved as it was through judicial intervention, the least that the present challenges deserve is a hearing untroubled by the burden of having to uphold the ratio in the Second Judges Case. The judges of an 11-judge bench, so constituted, would have, in any event, been free to strike down Article 124-A on the ground that its contents impinge judicial independence. But at least the bench would have had to provide solid reasons, transcending those contained in the Second Judges Case, on why the removal of primacy granted to a select band of senior judges of the Supreme Court in matters of making appointments to the court impairs the Constitution’s basic structure. When we consider the ratio, as is generally ascertainable from the majority’s judgment in the Second Judges Case, it becomes immediately apparent that the court’s reasoning has no basis in either the plain text of the Constitution or in the discussions held in the Constituent Assembly during the process of drafting Article 124. Article 124, as it originally stood, provides that the President shall appoint judges to the Supreme Court after consultation with such of the judges of the Supreme Court and of the High Courts in the States as the President may deem necessary for the purpose. And, where the appointment is of a judge other than the Chief Justice of India, the President is mandatorily required to consult the Chief Justice. Now, the Supreme Court, in the Second Judges Case, says that the word consultation in Article 124 ought to be read to mean concurrence. If you performed this substitution literally, Article 124 would effectively demand concurrence not only with the Chief Justice of India but also with “such of the judges of the Supreme Court” that the President may deem necessary for that purpose. This would have meant rather bizarrely that the president could consult whichever judges he feels need to be consulted, but once he consults those judges, their concurrence must be obtained. It was to solve this confusion wrought by its own faulty interpretation that the Supreme Court chose to introduce a system of a collegium of judges, who would be granted the final say in matters of appointments. Whichever way one wants to look at the decision, even if we were to consider the interpretation as one that seeks to maintain a fidelity to larger principles of judicial independence, the construal of “consultation,” to mean “concurrence,” is nothing but a re-writing of the Constitution’s text. In fact, when a member of the Constituent Assembly, M. Pocker Sahib, made a move to make the concurrence of the Chief Justice of India compulsory in matters of appointments, the proposed amendment was rejected outright. The chairperson, Dr. B.R. Ambedkar suggested that what was intended was a “middle course.” Therefore, the understanding of Article 124 in a manner that involves reading consultation to mean concurrence cannot be considered as a simple case of construing a text through commonly accepted rules of interpretation. Now, the bench hearing the present challenge to the 99th constitutional amendment might still refer the cases to an 11-judge bench. This would, in my opinion, be the appropriate procedure to follow, even if belatedly arrived at. For, if the Supreme Court were to declare Article 124-A, as introduced by the 99th amendment, as unconstitutional, based solely on the ratio in the Second Judges case, without a reference to an 11-judge bench, the decision would be deeply damaging for the court’s integrity. Assuming that no such reference is made, and that the present petitions are decided fully on their merits, I would still argue that Article 124-A requires to be upheld for the following reasons. There are, I would submit, very many different ways of ensuring judicial independence, and while primacy might be intended in some cases to serve in securing an independent judiciary, there is nothing in Paragraph 72 of the judgment in the Second Judges Case to suggest that granting primacy to the judiciary is the only means of securing an independent judiciary. In my belief, it would have to be separately argued that the absence of primacy in matters of judicial appointments, read in conjunction with the other safeguards that might be in place (such as the securing of tenure, pensions, etc.) is destructive to judicial independence. Here, it’s important to bear in mind that the discussions in the Constituent Assembly on an independent judiciary were almost dismissive of the idea of granting primacy to the judiciary in matters of its own appointment. In fact, in according the executive the express power to make the appointments, the Constituent Assembly, if anything, was recognising the precise converse of what came to represent the ratio in the Second Judges Case. The Constituent Assembly was always conscious of ensuring the independence of the judiciary, but it certainly didn’t see granting primacy to the judges in appointing their own brethren as a condition necessary for securing such autonomy. If anything the creation of the collegium, and the grant of primacy thereto, appears to infract the guarantee of separation of powers, universally regarded as being part of the Constitution’s basic structure. In any event, the Supreme Court, in the Second Judges Case, did come to believe that a requirement for primacy to judicial views was somehow inherent in the text of Article 124. But that can hardly constitute good enough reason for stopping Parliament from today removing the grant of such primacy. 2. Even assuming that the Second Judges Case did hold the primacy granted to the collegium to be a necessary condition for ensuring the independence of the judiciary, there remains the question of whether this finding constituted a part of the ratio decidendi of the judgment. The bench in the Second Judges Case could quite easily have found that the word “consultation” as used in Article 124 meant “concurrence,” without going into an analysis of whether the primacy granted was essential for securing judicial independence. In fact, the bench attributes the use of the word “consultation” as opposed to “concurrence” in Article 124 to the Constituent Assembly’s supposed motive of reducing executive involvement in the process of appointing judges. Here, I would defer further to Vishwajith Sadananda’s arguments, which go to show more conclusively that the Second Judges Case did not, as part of its ratio, hold primacy of the judiciary to be an essential component of securing the independence of the judiciary. It is trite to argue that the element of providing a compulsory consultation with the Chief Justice of India and other judges that the President may deem necessary for the purpose of appointing judges was introduced to serve as a check on complete executive power. But if this were to equate to granting primacy to the judiciary, and if we were to see that grant of primacy as somehow integral to judicial independence, it is impossible to conceive why the Constituent Assembly would vest the ultimate power of appointment with the Executive. 4. Reliance has been placed on the decision of the Supreme Court in Sub-Committee on Judicial Accountability v. Union of India, (1991) 4 SCC 699, a judgment, which came out two years before the Second Judges Case. Now, it’s clear from the paragraph extracted from this judgment that the case considers the process of consultation contained in Article 124 to represent a feature essential to securing judicial independence, and therefore a part of the basic structure of the Constitution. But, it’s important to bear in mind that at the time when the Sub-Committee on Judicial Accountability case was decided, the law of the land, as laid down by the Supreme Court in S.P. Gupta v. Union of India [The First Judges Case] was that the judiciary did not enjoy primacy in matters of appointments. On the contrary, the law was quite precise in recognizing the primacy of the executive’s view in the process of making appointments to the higher judiciary. So if we were to hold that the Sub-Committee case helps establish the position that Article 124, in, and by, itself, is a part of the Constitution’s basic structure, then it can equally be argued that the case only held that Article 124, as interpreted in a manner, which did not give primacy to the judiciary, was a part of the Constitution’s basic structure. This is so because at the time when the Sub-Committee case was decided, Article 124 was construed in a manner that did not give the judiciary primacy. 5. The 99th Constitutional Amendment, in introducing Article 124-A, does not impinge the holding in the Sub-Committee case, which merely held that consultation with the Chief Justice of India was an essential part of securing the independence of judiciary, and therefore a part of the basic structure of the Constitution. This consultation remains a part of the Constitution, through the operation of the National Judicial Appointments Commission. The only real consequence of the amendment is the removal of the collegium, which is nothing but an extra-constitutional creation by the Supreme Court, in the Second Judges Case. The fear that the executive might use the authority vested on it to appoint pliant judges favourable to its government’s outlook is well founded. But, the National Judicial Appointments Commission, established through the 99th Constitutional Amendment, does not permit such excessive authority. It’s a six-member commission heavily tilted in favour of according the judiciary a significant say in matters of appointment. It not only comprises the three most senior judges of the Supreme Court, but it also accords the Chief Justice of India a vote in determining the two eminent persons to be nominated on the commission. 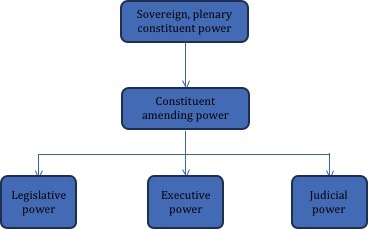 If Parliament were by law to modify the mode of the Commission’s workings (through an exercise of its powers under the newly introduced Article 124-C) in a manner contrary to the Constitution’s express provisions or in a manner that impinges the independence of the judiciary, the Supreme Court will always be free to declare such legislation void. The present challenges before the Supreme Court must no doubt be viewed with a touch of pragmatism, regarding the general proclivities of Indian governments. But, nonetheless as a matter of pure constitutional analysis, it is difficult to argue that the 99th constitutional amendment infracts the basic structure of the Constitution. If anything, the amendment comprehensively upholds the basic structure by recognising not only the importance of guaranteeing an independent judiciary, but also the importance of ensuring a strict separation of powers.